This residence is located in Ellicott City, MD. The project consisted of a 2-story addition, including a kitchen remodel, and expansion of the kitchen, dining, and living room on the main level. 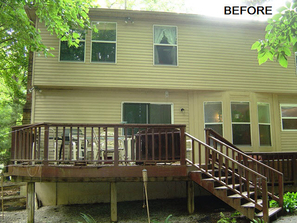 An addition to the master bedroom was added above the garage and the master bath was renovated. A large stairwell was added to provide access from the main level to a basement addition created for an in-laws quarters. J-Squared Architects was responsible for the design, construction documents, and construction administration of the project.